What would happen if Boston got 50 inches of rain? King tides, the very highest level of tides, flooded Boston’s Long Wharf last year. Imagine the streets filled with several feet of water. Subway and road tunnels submerged. The Charles River overflowing and swamping low-lying areas. Beacon Hill transformed into an island. Those scenarios provide a rough sketch of what experts say could occur if Boston received the historic amount of rainfall inundating parts of Houston, which is reeling under more than 50 inches in a matter of days from Hurricane Harvey. “We’d all be swimming,” University of Massachusetts Boston hydrology professor Ellen Douglas said. The picture here is hard to paint with much precision. Fifty inches of rainfall in that short period is essentially an off-the-charts scenario that hasn’t been seriously contemplated for Boston. The most rain the city has ever seen in an entire week is about 13.5 inches in 1955 when Hurricane Diane hit. It would take days, if not weeks, for experts to model out the impact of a 50-inch rainstorm in Boston. But you can expect things here would look somewhat similar to the scenes unfolding in Houston, experts said. Let’s put all this rainfall into perspective. Fifty inches of rain in such a short period of time would inundate virtually any city. Complicating matters for cities in the Northeast, including Boston, the stormwater drainage systems are generally not built to withstand massive rainfall, unlike systems in other parts of the country that are prone to such downpours. Despite the doomsday scenarios, experts said it is highly unlikely, bordering on impossible, that Boston would receive the same level of intense, unrelenting rainfall in such a short period that is besieging Houston. Fifty inches of rain over several days here “would be extreme, if not beyond the realm of possibility,” Vallee said. Generally, only a major storm, such as a hurricane, that stalls over an area for days produces that kind of rain. In Boston, direct hits from hurricanes are relatively rare. Instead, we tend to get storms that have moved up the coast, weakening into tropical storms or remnants as they pass over land and cooler Atlantic waters. And, while those weaker storms can still drop their fair share of rain, they don’t tend to hang out here for long. The National Oceanic and Atmospheric Administration estimates that a so-called once-in-100-years storm in the Boston area would dump about 8 inches of precipitation within 24 hours. A once-in-500-years storm would drop about 11 inches. Predictions for the Houston area are nearly twice as high. A once-in-100-years storm there would drop about 14 to 15 inches of rain in a day. A once-in-500-years storm would dump approximately 19 to 20 inches, according to estimates calculated by the United States Geological Survey and state officials in Texas. Still, the threat of severe flooding in Boston is quite real. Even lesser amounts of rain than Houston received can cause serious problems. In October 1996, when about 8 inches of rain fell in three days, the Muddy River overflowed and flooded parts of the Green Line subway tunnel between Kenmore and Arlington stations. And in March 2010, Boston received about 14.9 inches, a city record for that month. The heavy rains closed roadways and flooded basements. The potential for serious flooding is expected to only get worse in the years to come because of climate change, officials say. Rising sea levels attributed to climate change are expected to cause routine flooding in Boston in the coming decades. King tides, the very highest level of tides, offer a glimpse of what could someday become daily flooding. They already lap over Long Wharf and Morrissey Boulevard. Climate change is also expected to increase the frequency and intensity of extreme weather, including rainfall and wind. Parts of the city already face serious flood risk if winds from a major storm were to push ocean waters ashore. NOAA maps displaying predictions of near-worst-case flooding scenarios caused by hurricanes show that even a Category 1 storm — the lowest threshold for a hurricane — could flood large sections of Boston and Cambridge, while stronger hurricanes could submerge much of the area under several feet of water. And that only accounts for ocean storm surge, not for rainfall or river flooding. 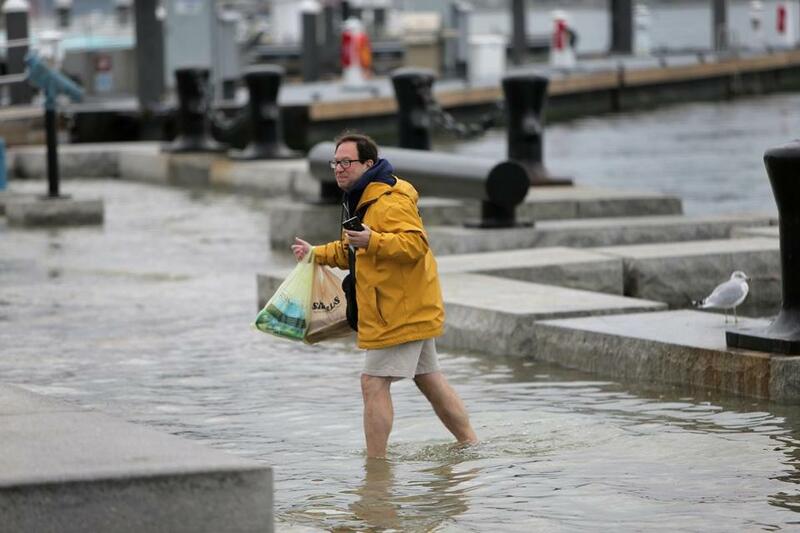 John P. Sullivan Jr., chief engineer for the Boston Water and Sewer Commission, said that if Hurricane Sandy had hit Massachusetts at high tide, instead of low tide, the city could have seen flooding of the severity experienced by New York City. A study by the Boston Harbor Association said nearly 6 percent of Boston, including much of downtown, would have been flooded if that 2012 storm had hit at high tide. Couple 2½ feet of sea-level rise with a Sandy-sized storm, and 30 percent of the city would have been flooded. Boston officials said they have plans for how to handle such natural disasters, including for evacuating residents, if needed. Still, Walsh said Harvey has forced him and his staff to take another look at the city’s plans. The city is also taking steps to study and prepare for the effects of climate change. Officials said they are focused on identifying “shovel-ready” projects to protect areas particularly vulnerable to storm surge, including East Boston and Charlestown, and plan to do the same for South Boston and other parts of the city. globe.com. Follow him on Twitter @mrochele.